Pecan’t you spare a slice of pie? Home > Blog > Pecan’t you spare a slice of pie? Hey there, all you Nutty Folks! Depending on your love for pecans—as well as pie—you may already know (with a certain level of zeal) that today is National Pecan Pie Day! In honor of this day, I’ve compiled a list of five interesting facts that you probably didn’t know about pecans or pecan pie. Since the pecan tree is native to North America, it should come as no surprise that more than 80% of the world’s annual pecan crop comes from the U.S.
BIG fans of pecan pie down south, it should be even LESS surprising that Albany, Georgia is the world’s pecan capitol. 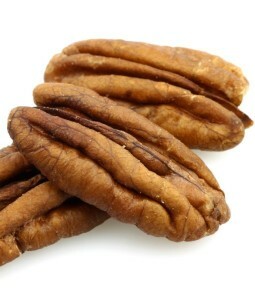 Albany alone holds claim to over 600,000 pecan trees! On average, each tree produces 45 pounds of pecans each year. That means Albany produces roughly 27 million pounds of pecans every year! That’s a LOT of pecans! An extremely heart-healthy nut, pecans deliver antioxidants, 19 vitamins and minerals, and fat—the good kind. Among other minerals, zinc is found in the pecan which is quite beneficial to the body’s testosterone production in both boys and girls. Roughly 78 pecans go into the average pecan pie. 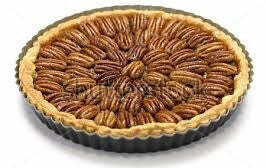 There are about 57 pecans in a pound, thus the average pecan pie weighs about 1.37 pounds. What does that mean? It means that, with the amount of pecans grown in Albany, Georgia, they can make roughly 19,708,029 delicious pies every year! Though the origin of pecan pie is somewhat hard to trace, many people credit it to the French who were introduced to the pecan by the Native Americans in the late 1800s. However, some have heard tell that pecan pie has been around since the early 1800s and originated in Georgia. There are no documented recipes that date back this far, but…you never know! Enjoy a pecan pie of your own today and, as always, thanks for reading!